Ever hear the expression "hair of the dog" when it comes to drinking? It comes from an old Scottish belief that if you take hairs from a dog that bit you and put it over the wound, it would prevent bad things from happening. When applied to drinking, it means if you are hungover the next day, have a glass of the same alcohol from the night before and it will lessen your hangover. Of course, neither the Scottish fable or the drinking expression are true cures. Let's look at a myriad of myths about drinking alcohol that need to be put to rest once and for all. The fact is that one 12-ounce can of beer, one 5-ounce glass of wine, or one normal sized cocktail containing about 1 1/2 ounces of liquor are all equally intoxicating. Each alcoholic beverage is considered a standard drink containing about the same amount of alcohol. Where the myth has some merit is if you were to drink 12 ounces of liquor compared to one 12-ounce can of beer, then yes, the 12 ounces of liquor might have you hugging a toilet bowl. There is a saying, "Beer on whiskey, mighty risky." This saying is not about how if you mix the drinks you might become drunker. This expression and others like it are warnings about how mixing alcohols might make you sick to your stomach. Similar to the expression, "Beer before liquor, never been sicker. Liquor before beer, you’re in the clear." Mixing drink types is usually a recipe for disaster. Alcohol is alcohol. Your body can only process so much before it goes into preservation mode. Drinking a lot of anything alcoholic can lead to dehydration and a nasty hangover. While showers, fresh air, and hot coffee might feel a little refreshing to a person who is three sheets to the wind, none of these things will sober a person. Only time can help a person sober up. It takes the body approximately one hour to eliminate the alcohol in one drink. It is true what they say, "Give a drunk a cup of coffee and all you have is a wide-awake drunk." Once absorbed into the bloodstream, alcohol gets processed by the kidneys, lungs, and liver. This is why a urine, blood, or breathalyzer test can all detect alcohol in the body. The fact is drinking on a full stomach will only delay the absorption of alcohol into the bloodstream, not prevent it. Eating before you drink is not a defense against getting drunk. Eating a filling, greasy, carb-loaded meal may prevent you from suffering worse hangover symptoms compared to drinking on an empty stomach. However, eating tons of calories will not prevent you from becoming intoxicated. There is a giant myth that what works for one, works for another when it comes to just about anything. But, just with anything, people are all different. 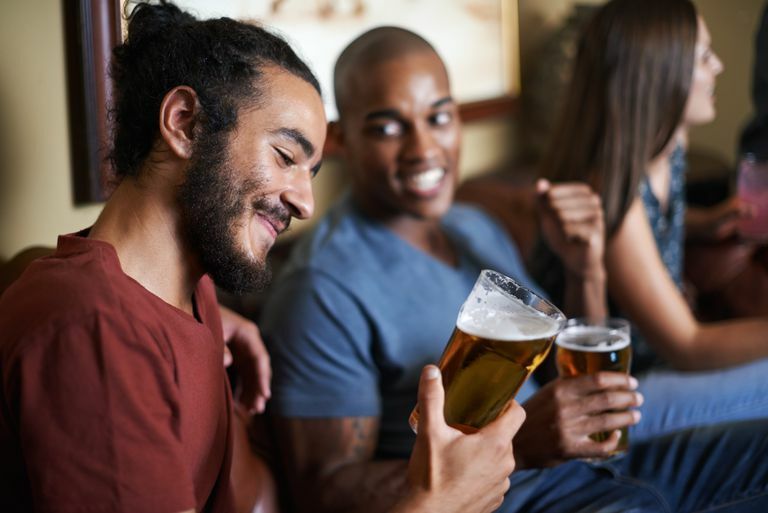 There can be many factors that may affect a person's reaction to alcohol—body weight, metabolism, tolerance level, gender, body chemistry, to name a few. Also, there may be various genetic factors that come into play as to how individuals react to drinking alcohol.